Shadow Bugs are the small, glowing, violet spheres of which the members of the Subspace Army are made in The Subspace Emissary. They are apparently embodiments of a primordial substance. Shadow Bugs were created by extracting a mysterious substance from Mr. Game & Watch, leading Tabuu to have him captured to become the source of the Subspace Army's soldiers. They first appeared in a Smash Bros. DOJO!! update called "This World", which introduced the main plot of The Subspace Emissary, shown being dropped down from the Halberd, as well as surrounding a single Primid. Additionally, Shadow Bugs are mentioned in Palutena's Guidance for Mr. Game & Watch, in which Pit says, "Hey, it's a Shadow Bug!". This is a reference to how Shadow Bugs were extracted from Mr. Game & Watch. The Shadow Bowser pictured on the right is made out of Shadow Bugs. Shadow Bugs are capable of copying a character's trophy and assuming his/her appearance, but are also capable of altering certain qualities such as size, as seen in the fight with the giant Diddy Kong. A copy of a character created by Shadow Bugs will have a purple tinge, be surrounded by a smoky shadow aura, and possess glowing yellow eyes. 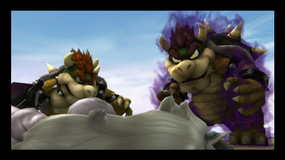 Bowser himself had a platoon of Shadow Bugs which he ordered to serve as a clone of himself, both to act as a decoy and a second-in-command. The Shadow Bugs trophy in Brawl. Embodiments of a primordial substance that can take the form of any number of lesser Subspace foes. They can also copy the forms of trophies to create evil doppelganger versions of them. The mysterious substance inside Mr. Game & Watch can be extracted endlessly. Once Tabuu discovered this, he used Mr. Game & Watch to create the Subspace Army. Despite Bowser having a shadow clone, he has not been trophied before it is first seen. This page was last edited on February 18, 2019, at 21:57.